A bridge built by the SANDF at Pontseng in the Eastern Cape. Minister of Defence and Military Veterans Nosiviwe Mapisa-Nqakula has handed over two bridges to communities in the Eastern Cape after six children were swept away whilst crossing a river earlier this year. In early March, six children died after being swept away whilst crossing the Freyistata River near Matatiele after school. Following the incident, Mapisa-Nqakula sent a team of South African Army Engineers to Matatiele to carry out an assessment where the incident occurred to determine what could be done to assist the community. The report was subsequently delivered to the Minister, which called for a bridge to be constructed as a matter of urgency. Mapisa-Nqakula on 9 April visited the Pontseng community near Matatiele and engaged with community leaders and the public on the recommendations of the assessment team. According to Siphiwe Dlamini, Department of Defence Head of Communication, the Minister handed over one bridge at Pontseng on 9 April and a second at Lusikisiki on 10 April. He said the Pontseng area where the six children died is cut by four rivers, and an additional three bridges will be constructed. The bridges are the Bailey type, which can be put up quickly – Dlamini said it takes about a week to install one. Building bridges to assist far-flung communities and villages in remote parts of Eastern Cape is not new for the engineers of the South African Army, having built bridges in rural Eastern Cape for a while now. Last October SA Army Chief, Lieutenant General Lindile Yam, said assessments had been completed for nine bridges in the Eastern Cape. This is part of the national defence force’s contribution to Operation Chariot, providing humanitarian and disaster relief to all South Africans. Engineer Formation skills and equipment have previously been utilised to improve access to services by permanently putting down Bailey bridges and, in one instance defenceWeb has knowledge of, building a permanent bridge in Hammanskraal north of Pretoria. 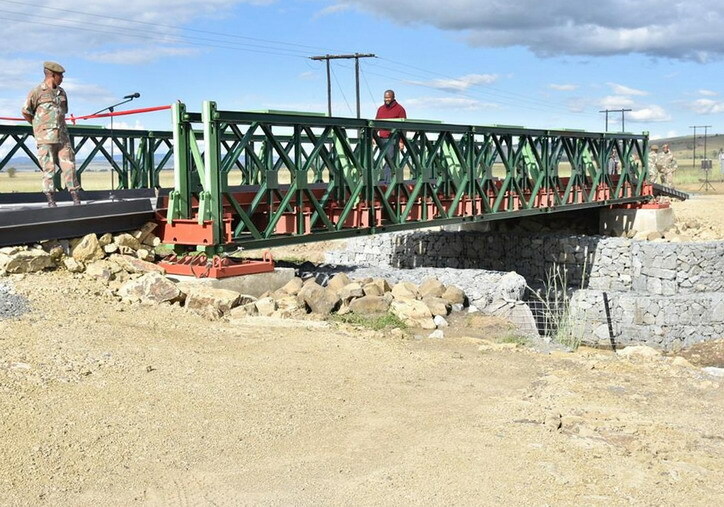 Bailey bridges have previously been positioned to ease access across gorges and turbulent rivers for people living in remote areas of the Eastern Cape. Also whilst in the Eastern Cape, Mapisa-Nqakula on 10 April visited troops at Port St Johns who are preparing for deployment to the Democratic Republic of Congo. She was accompanied by SA Army Chief Lieutenant General Lindile Yam.